I am delighted to be able to announce that 'Train 2' - the first of the refurbished D78 Stock trains to 'production' standard, tested on the main line today. 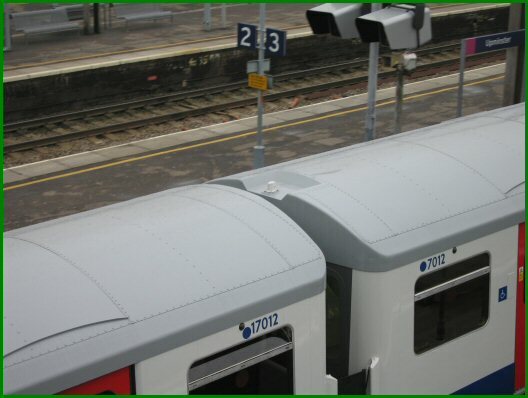 At about 10:00 on the 10th February 2005 I received a phone call from our Line Standards Manager (LSM) that the train was just leaving Upminster depot for proving runs for the new Customer Information System, if I wanted to try to intercept its westbound trip. He was joining the train himself, and would keep me informed of its progress. Fortunately, I was on a rest day, and was able to quickly make my way to Earls Court, suitably armed with my camera. My plan had been to find out what its planned trip was to be, with the intention of getting some photos of it at various locations. However, it didn't quite work out like that! 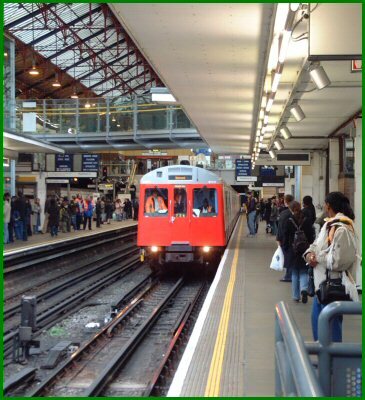 These were my first views of the train as it arrived at Earls Court, platform 3. The train is being driven by a member of the Test Train crew, and the Train Master can be seen on the other side of the cab. After the train had berthed, I was greeted by the sight of this strange figure appearing form the cab! It is no less than our LSM! (Sorry Steve, but if you appear like that you must expect the consequences!). I was invited aboard the train (which I had not been expecting) and having signed in with the Train Master, was introduced to the others who were aboard the train. There were representatives from Bombardier, Spitfire, Metronet and, of course, London Underground. As we headed off westbound, I was given the Grand Tour of the train by the Project Engineer from Bombardier and an opportunity to take photos of the interior - these will appear later on this page in the form of a Gallery - and an insight into what has been done to the train. During our trip to Richmond our LSM took the controls of the train, becoming the first member of District line staff to do so. Note the slightly more serious expression on his face compared to that earlier! Arrival at Richmond presented an opportunity for a photograph of the whole team who were involved in today's tests. At each of the locations where the train berthed, there were a number of members of the public showing interest in the 'new' train. Of course, the train wasn't open to the public, but the reaction to its appearance was enthusiastic, and here we see a couple of ladies at Richmond chatting with the Bombardier Project Engineer with our LSM in the background. We're now at the east end of the train preparing to depart from Richmond. An interesting comparison of the 'old' and the 'new'. The real surprise and privilege for me now came. I was invited to drive the train, and become the first District line operator to actually do so. For the record, I drove the train from Richmond to High Street Kensington, to Ealing Broadway, to Acton Town East sidings and then back into Acton Town eastbound platform - a total time of about two hours. I'm pleased to say that the train hardly differs in performance at all and as so few changes have been made it was all immediately familiar. The Customer Information System (the automated announcer) was in operation throughout and certainly works 'as advertised'. I think a bit of fine tuning will be done to the scripts, but essentially it worked very well - even the voice is not intrusive (a criticism I know colleagues on some other lines have about their similar systems). As part of the test the train was stopped at each station and the door open and close buttons were operated to trigger the announcements, although the doors had been set to remain closed, of course. This also gave the chance to use the new offside door close button, and to try out the slight changes that will be needed to stopping positions that will result from this installation. The only slight 'niggle' (and it's not a serious one) is that the door open buttons for the offside are now differently aligned, and this will take a little getting used to - but a very small point! Up to now I've always taken steps to try to avoid my own picture appearing on this site, but today I break this convention (well, almost!) Here's your intrepid correspondent at the controls as we departed Richmond on my first ever driving trip on the 'new' train. The new door buttons for the offside doors are visible. As I mentioned above, I relinquished the train at Acton Town. As it happened, one of my colleagues was waiting on the platform to go home at the end of his duty, and he was very interested to hear my first reactions, and I was pleased to report that I was impressed with all that's been done. I can't wait to see the train in service now, and for others to get the chance - either as passengers or drivers - to give their judgement on it too! What follows are the remainder of the photos I took over the course of the day. My thanks to Steve Sullivan, our LSM, and all those who were involved in today's 'outing', and for allowing me to feel as if I've just a little place in London Underground history! 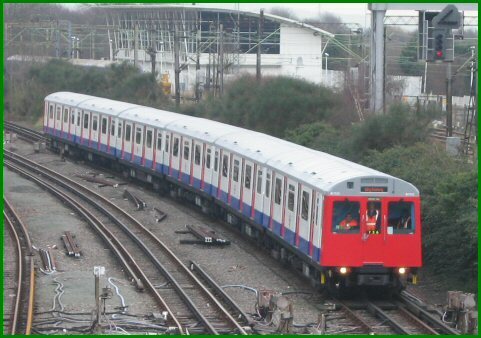 On the 12th February 2005 the refurbished train again headed towards Upminster, and it Solidbond's turn to get out with his camera. Photographed from the footbridge at the east end of the station, the refurbished train is seen heading out of the depot on 53 Road. The new Customer Information System (CIS) employs GPS technology, and the receiver is seen here as fitted to DMC 7012. All DMC's will be similarly equipped. The following gallery shows the other photos taken by Solidbond on the day. Solidbond has also provided me with a couple of video clips of the train, which I hope to include here at some point. However, at the moment I'm holding back on these as my server space is starting to run short, and I need to wait until I have more space available - hopefully this will be quite soon! Following my first comments on the first trip, I was very pleased to receive an e.mail from the Danish company that are providing the CIS equipment for the programme. They are Focon Electronic Systems A/S, and you can take a look at their web site here. 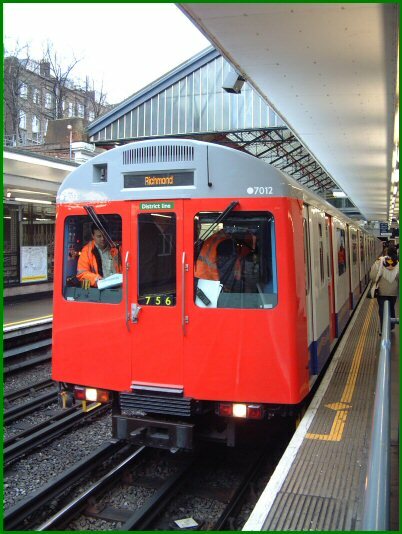 In the last few days I've been in correspondence with Mike James of London Underground's Chief Engineers Directorate, who has very kindly supplied me with, and given permission for me to reproduce a paper he and Ian Fisher of Metronet Rail SSL wrote on the subject of the refurbishment programme. It not only gives details of the work being carried out, but also an excellent insight into the rationale behind the programme. It also goes into some detail about the Customer Information system, although, when written, this was known as the Passenger Information System. The former name is now that used for the equipment. The paper is in the form of an Adobe document, and can be viewed by clicking on the image below. My thanks to Mike for allowing me to share this with you.